AirGuard Microguard HEPA Filters are used in filter applications for hospitals, data centers, nuclear facilities, pharmaceuticals, laboratories, aerospace, food processing and optics. The Commercial HEPA Filter Replacement 23-3/8" x 23-3/8" x 11-1/2" High Capacity is the correct replacement for the AirGuard MicroGuard MGLR-501A-MC. The Commercial HEPA Filter Replacement 24"x24"x11.5" High Capacity is the correct compatible replacement for the Microguard 2971489. The Commercial HEPA Filter Replacement 24"x24"x11.5" Standard Capacity is the correct replacement for the Microguard 2971489 SC. The Commercial HEPA Filter Replacement 23-3/8" x 11-3/8" x 11-1/2" High Capacity is the correct replacement for the AirGuard Microguard MC2000-500A HC. The Commercial HEPA Filter Replacement 23-3/8" x 11-3/8" x 11-1/2" Standard Capacity is the correct replacement for the MC2000-500 SC. The Commercial HEPA Filter Replacement 23-3/8" x 23-3/8" x 11-1/2" High Capacity is the correct replacement for the AirGuard MicroGuard MC2000-500 HC. 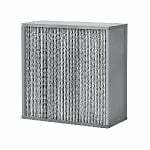 The Commercial HEPA Filter Replacement 23-3/8" x 23-3/8" x 11-1/2" Standard Capacity is the correct replacement for the AirGuard MicroGuard MC2000-501A SC. The Commercial HEPA Filter Replacement 24"x24"x11.5" High Capacity is the correct replacement for the Airguard MicroGuard MC2000-501A HC. The Commercial HEPA Filter Replacement 24"x24"x11.5" Standard Capacity is the correct replacement for the AirGuard MicroGuard MC2000-500-99 SC. The Commercial HEPA Filter Replacement 24"x24"x11.5" High Capacity is the correct replacement for the AirGuard MicroGuard MC2000-501 HC. The Commercial HEPA Filter Replacement 24"x24"x11.5" Standard Capacity is the correct replacement for the AirGuard MicroGuard MC2000-501 SC. The Commercial HEPA Filter Replacement 23-3/8" x 23-3/8" x 11-1/2" Standard Capacity is the correct replacement for the MicroGuard MGLR-501A-MC SC. The Commercial HEPA Filter Replacement 24"x12"x11.5" High Capacity is the correct replacement for the MicroGuard MGLR-501A-MC HC. The Commercial HEPA Filter Replacement 24"x24"x11.5" Standard Capacity is the correct replacement for the Airguard Microguard 2970099. The Commercial HEPA Filter Replacement 23.3" x 11.3" x 11.5" High Capacity is the correct replacement for the AirGuard Micro Guard MC2000-500A filter. The Commercial HEPA Filter Replacement 23.3" x 11.3" x 11.5" Standard Capacity is the correct replacement for the AirGuard MicroGuard AirGuard MC2000-5 SC.